There are three other published claims about the origins that sometimes crop up in discussion. In his autobiography Sheilas, Wogs and Poofters Johnny Warren says it was in 1971 prior to another tour to Vietnam in 1972 that Tony Horstead first used the term. 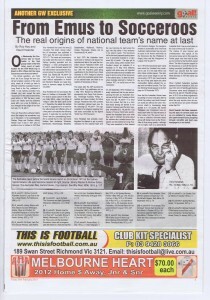 Sid Grant, whose collection of information was published in 1974, says the word was adopted in 1972–73: ‘The name and accompanying badge were the work of a leading Sydney sporting journalist and his colleague, a news photographer.’ Laurie Schwab asserts that the national team was dubbed the Socceroos during the successful 1973–74 World Cup mission. By 1974 the word Socceroos is being used without explanation in Australian Women’s Weekly, so it was obviously in common usage by then. Tony Horstead did not accompany the team to Vietnam in November 1967. He wrote a soccer column in the Sydney Daily Mirror, under the byline of ‘Hotspur’. After the team came home on 1 December he asked his readers to send in suggestions for a name for the national team and offered a prize of a free pass to all matches the following season. A week later he reported that ‘Emus’ was the overwhelming favourite by almost four to one, next came Wattles, then Jackaroos, Wombats, Bandicoots, Boomerangs, Birubieds, Baddawalers, Walleroos, Merinos, Koalas, Woomeras, Sharks, but no Socceroos. In April 1970 the Australian team went back to Vietnam and played two matches and later in the year the Australian Soccer Federation (ASF) sent Rale Rasic and his team on a world tour with the long-term goal being qualification for the World Cup in West Germany in 1974. Hotspur’s columns just refer to the Australian soccer team or the national team and there is no mention of Socceroos or Emus. 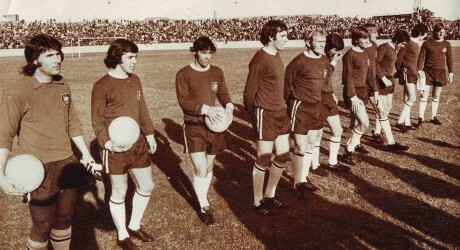 Two years later the ASF launched its formal World Cup qualification bid on 3 May 1972. Backed by $100,000 in sponsorship from Pepsi Cola (Australia), Travelodge Australia, Philips Industries and News Limited, Sir Arthur George, President of the ASF, unveiled the Australian national team icon for the campaign. The logo consisted of a kangaroo wearing football boots surrounded by the legend ‘World Cup 1974 Socceroo’. Tony Horstead had probably never forgotten his attempt to get a punchy nickname for the national team and the next morning he had turned the logo into that name. A key sentence in his column reads: ‘The Socceroos will be the best prepared sporting team ever to represent Australia in a major event’. 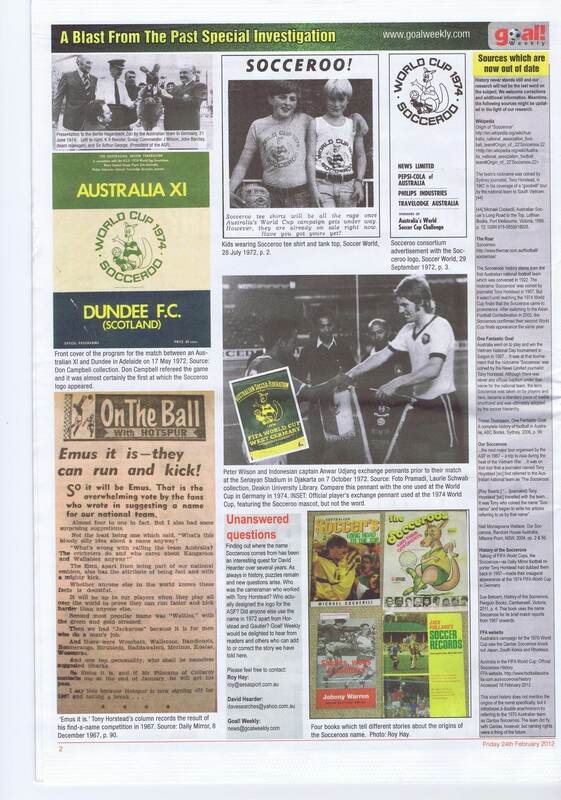 The logo got its next public outing when Dundee from Scotland played an Australia XI in Adelaide on 17 May 1972. Matches against club sides were not regarded as full internationals and Horstead was keen to tie the name of the Socceroos to the national team. So later that year, when Australia returned to Vietnam in October 1972, he could focus on that connection. ‘Now that the Australian Soccer team is basking in honour and glory after its World Cup victory over South Korea it can surely do without the name “Socceroos”which is increasingly being applied to it. Of course, the names ‘Wallabies’ and ‘Kangaroos’ have already been taken by national teams of other codes, but if the soccer team is to have a collective nickname what’s wrong with being known as the “Emus”. After all, that strong speedy—although not too bright—bird is so authentically Australian that it has a proud place on the Coat of Arms’. When Football Federation Australia replaced Soccer Australia in 2005, the new CEO John O’Neill thought that the Socceroos name would disappear in time. That did not happen. In 2012 it is so firmly engrained in people’s consciousness that it is just about the only survivor from old soccer into the brave new world of football under the FFA. David Hearder has been researching this topic for several years and we are indebted to Louise Moran, who spent several hours ploughing through microfilm and hard copy newspapers on our behalf. Michael Cockerill, Australian Soccer’s Long Road to the Top, Lothian Books, Port Melbourne, 1998, p. 12. Johnny Warren with Andy Harper and Josh Whittington, Sheilas, Wogs and Poofters: An incomplete biography of Johnny Warren and Soccer in Australia, Random House, Sydney, 2002, p. 133. Sid Grant, Jack Pollard’s Soccer Records, Jack Pollard, North Sydney, 1974, p. 258. Laurie Schwab, The Socceroos and their Opponents, Newspress, Melbourne, n.d.,  p. 4. ‘Wonder how the Socceroos would take to girls getting in on their act?’, Australian Women’s Weekly, Wednesday 9 July 1975, p. 40; ‘They even sold the Australian Socceroos’ colors with a kangaroo-style tail sewed on. That one kept the fans on the hop.’ Australian Women’s Weekly, Wednesday 28 August 1974, p. 113. Tony Horstead, ‘Emus it is—they can run and kick,’ On the ball with Hotspur, Daily Mirror, 8 December 1967, p. 90; see also Tony Horstead, ‘Thanks to Tour Team’, On the ball with Hotspur, Daily Mirror, 1 December 1967, p. 73. 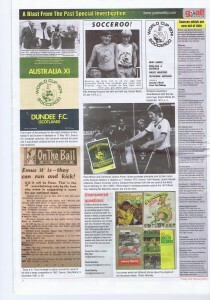 Soccer World, 12 May 1972, p. 7; Daily Telegraph, 4 May 1972, p. 53; Sydney Morning Herald, 4 May 1972, pp. 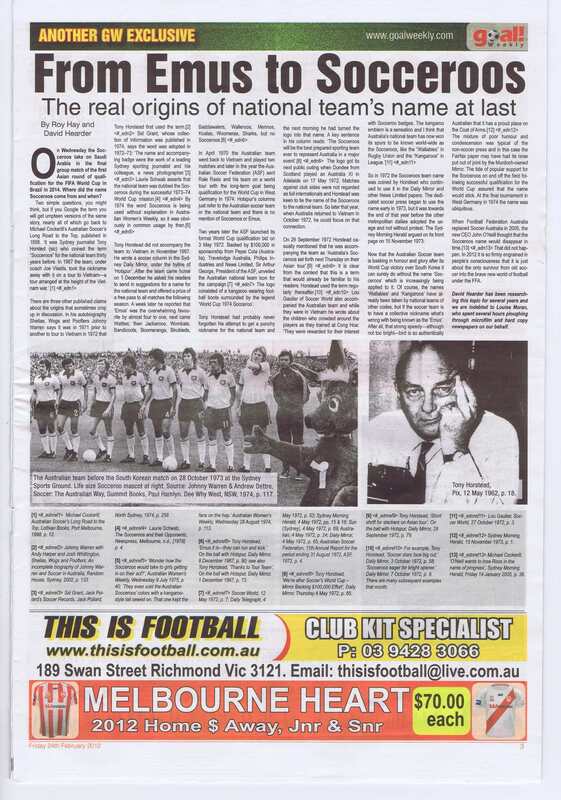 15 & 16; Sun (Sydney), 4 May 1972, p. 69; Australian, 4 May 1972, p. 24; Daily Mirror, 4 May 1972, p. 65; Australian Soccer Federation, 11th Annual Report for the period ending 31 August 1972, ASF, 1972, p. 4. Tony Horstead, ‘We’re after Soccer’s World Cup – Mirror Backing $100,000 Effort’, Daily Mirror, Thursday 4 May 1972, p. 65. Tony Horstead, ‘Short shrift for slackers on Asian tour’, On the ball with Hotspur, Daily Mirror, 29 September 1972, p. 79. For example, Tony Horstead, ‘Soccer stars face big cut,’ Daily Mirror, 3 October 1972, p. 58; ‘Socceroos eager for bright opener,’ Daily Mirror, 7 October 1972, p. 9. There are many subsequent examples that month. Lou Gautier, Soccer World, 27 October 1972, p. 3. Sydney Morning Herald, 15 November 1973, p. 1. Michael Cockerill, ‘O’Neill wants to lose Roos in the name of progress’, Sydney Morning Herald, Friday 14 January 2005, p. 36. Finding out where the name Socceroos comes from has been an interesting quest for David Hearder over several years. As always in history, puzzles remain and new questions arise. Who was the cameraman who worked with Tony Horstead? Who actually designed the logo for the ASF? Did anyone else use the name in 1972 apart from Horstead and Gautier? Goal Weekly would be delighted to hear from readers and others who can add to or correct the story we have told here. History never stands still and our research will not be the last word on the subject. We welcome corrections and additional information. Meantime, the following sources might be updated in the light of our research. The team’s nickname was coined by Sydney journalist, Tony Horstead, in 1967 in his coverage of a “goodwill” tour by the national team to South Vietnam. Michael Cockerill, Australian Soccer’s Long Road to the Top, Lothian Books, Port Melbourne, Victoria, 1998, p. 12. ISBN 978-0850918928. The Socceroos’ history stems from the first Australian national football team which was convened in 1922. The nickname ‘Socceroos’ was coined by journalist Tony Horstead in 1967. But it wasn’t until reaching the 1974 World Cup finals that the Socceroos came to prominence. After switching to the Asian Football Confederation in 2005, the Socceroos confirmed their second World Cup finals appearance the same year. Australia went on to play and win the Vietnam National Day tournament in Saigon in 1967… It was at that tournament that the nickname ‘Socceroos’ was coined by the News Limited journalist Tony Horstead. Although there was never any official baptism under that name for the national team, the term Socceroos was taken on by players and fans, became a standard piece of media shorthand and was ultimately adopted by the soccer hierarchy. Trevor Thompson, One Fantastic Goal: A complete history of football in Australia, ABC Books, Sydney, 2006, p. 99. Neil Montagnana Wallace, Our Socceroos, Random House Australia, Milsons Point, NSW, 2004, pp. 2 & 56. Talking of FIFA World Cups, the Socceroos—as Daily Mirror football reporter Tony Horstead had dubbed them back in 1967—made their inaugural appearance at the 1974 FIFA World Cup in Germany. Sue Behrent, History of the Socceroos, Penguin Books, Camberwell, Victoria, 2011, p. 4. This book uses the name Socceroos for its brief match reports from 1967 onwards. Australia’s campaign for the 1970 World Cup saw the Qantas Socceroos knock out Japan, South Korea and Rhodesia. This short history does not mention the origins of the name specifically, but it introduces a double anachronism by referring to the 1970 Australian team as Qantas Socceroos. The team did fly with Qantas, however, but naming rights were a thing of the future.